Unlike many romantic painters and writers of his day, Hawthorne generally resisted the popular subject of the American Indian in his writing. 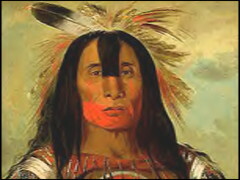 While Bryant, Longfellow, and Cooper achieved success sentimentalizing and ennobling the American Indian, Hawthorne’s Indians remain mostly in the background of his stories, providing verisimilitude for works whose settings and themes are more concerned with English than Indian lives and history. In 1854 Hawthorne wrote: “It has often been a matter of regret for me, that I was shut out from the most peculiar field of American fiction, by an inability to see any romance, or poetry, or grandeur, or beauty in the Indian character. . . . No writer can be more secure of a permanent place in our literature, than the biographer of the Indian chiefs. . . . I do abhor an Indian story.” It’s the “bad” Indian—the Indian of the Puritan imagination--not the Noble Savage that, for the most part, shows up in Hawthorne’s fiction. And though he may “abhor” an Indian story, Hawthorne is, at times, capable, as Margaret Moore has noted, of feeling sadness for the losses of Native Americans and, in particular, for the cruelties committed against them by Christian settlers. More often, in fact, Hawthorne uses Indians to highlight the sins of his English characters rather than to explore directly the American Indian perspective or experience. Margaret B. Moore in The Salem World of Nathaniel Hawthorne provides an overview of Hawthorne's treatment of Native Americans as subjects in his writings.